The NEC SV8100 4-Port Analog Line Card CD-4COTB is used when you want to connect up to 4 analog telephone lines (PSTN / CO's) to the SV8100 phone system. This card is one of the most popular ways to add regular telephone lines to the NEC SV8100 telephone system. 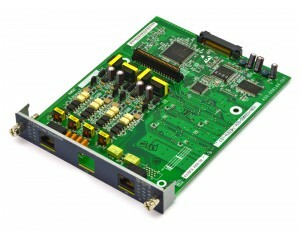 This card immediately expands the SV8100 phone system with 4 analog CO's and can be further expanded by adding a 4-port daughter card to the CD-4COTB.